Also known as the zygapophyseal or apophyseal joint, is a synovial joint between the superior articular process of one vertebra and the inferior articular process of the vertebra directly above it. There are two facet joints in each spinal motion segment. 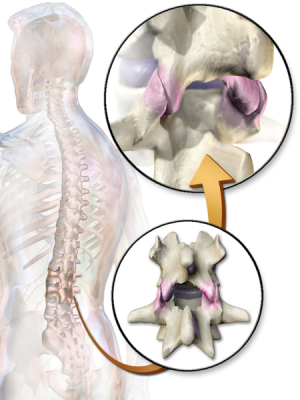 The facet joints are situated between the pedicle and lamina of the same vertebra and form the articular pillars that act to provide structural stability to the vertebral column as a whole. Together with the disc, the bilateral facet joints transfer loads and guide and constrain motions in the spine due to their geometry and mechanical function. Cervical Region = 45 degrees; frontal plane; all movements are possible such as flexion, extension, lateral flexion, and rotation. The articulating facets in the cervical vertebrae face 45 degrees to the transverse plane and lie parallel to the frontal plane, with the superior articulating process facing posterior and up and the inferior articulating processes facing anteriorly and down. Lumbar Region = 90 degrees; sagittal plane; only flexion and extension. The facet joints in the lumbar region lie in the sagittal plane; the articulating facets are at right angles to the transverse plane and 45° to the frontal plane. The superior facets face medially, and the inferior facets face laterally. This changes at the lumbosacral junction, where the apophyseal joint moves into the frontal plane and the inferior facet on L5 faces front. 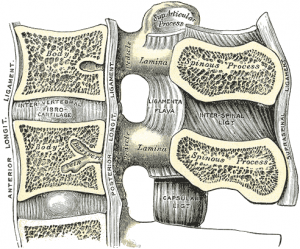 This change in orientation keeps the vertebral column from sliding forward on the sacrum. Guide and limit movement of the spinal motion segment. Contribute to stability of each motion segment. ↑ Nicolas V. Jaumard, William C. Welch, and Beth A. Winkelstein1. Spinal Facet Joint Biomechanics and Mechanotransduction in Normal, Injury and Degenerative Conditions. J Biomech Eng. 2011 July; 133(7): 71010–NaN. ↑ Hamill, Joseph, and Kathleen M. Knutzen. Biomechanical Basis of Human Movement, 3rd Ed., USA: Lippincott Williams & Wilkins, 2009.